Homepage. This page: A 1920s letterheading with a solid-tyred motor van illustration. A. Humpherson - Removal Contractor. Buried within a box of paperwork relating to the establishment of a garage business in 1950s' Dorset, was this piece of paper. It had been used to jot down plans for the erection of a new workshop. While that is interesting in itself, of more interest is the paper on which it was written. 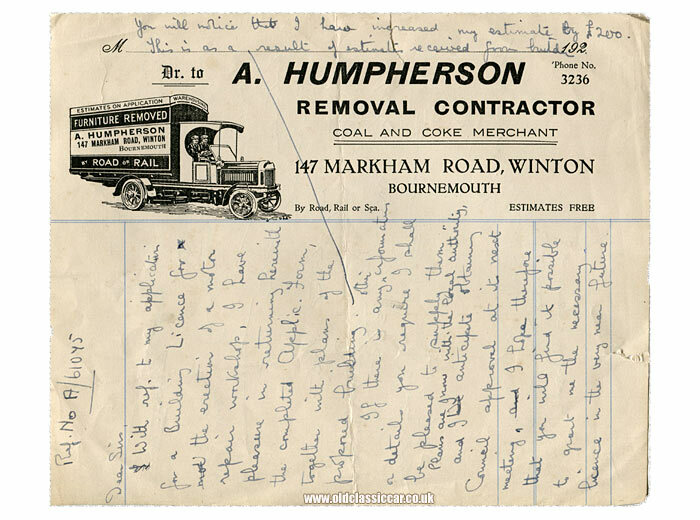 Dating to the 1920s, it relates to a removals firm ran by A. Humpherson, "coal and coke merchant", of 147 Markham Road, Winton, in Bournemouth. The illustration is of a marvellous solid-tyred motor lorry, with two chaps sat within the exposed confines of the "C" shape cab. Weather protection was minimal at best for these hardy pioneer lorry drivers. The actual vehicle, with its signwriting, must have looked very eye-catching as it chugged around the roads of Bournemouth. In style it's not dissimilar to that used by Joseph May in the 1920s, an illustrated letterheading for which can be found on this page of the site. The Markham Road property today. 147 Markham Road is still in existence, as a four-bedroom home rather than a business property (it is shown in the centre of the Streetview image below). An access path runs down the side of it, while to the left is a more modern home. Perhaps at one time a garage building was associated with number 147, acting as the base for the removals business of Mr Humpherson? More items of paperwork relating to vintage vehicles and vehicle-related services can be found in the Motoring Collectables section. A number of letterheadings and invoices relating to removals businesses, and the vehicles they used, can be found. This page, for instance, features an illustration of a steam lorry that was used in and around Southsea, also in the 1920s.